Can Hitting Your Head Against the Ground Cause Brain Damage? As we are now officially in the fall season, football is on everybody’s minds. Seasons are well underway, both in amateur teams and professional, and there is palpable excitement from fans everywhere. However, if you are a parent of a younger football player, it is important to not get lost in the excitement and forget that there is not only a lot of wear and tear occuring on athletes’ bodies, but also the ever present risk of a life-changing accident such as a traumatic brain injury. As football is a contact sport, players are prone to be knocked down. This begs the question of whether athletes, or anyone for that matter, can experience brain damage after their head collides with the hard ground. The most common type of brain injury that could come from one’s head making intense contact with a hard surface like the ground would be a concussion. But concussions can occur at any time and any place, and against any surface. What happens when a concussion occurs is that your brain inside your skull moves back and forth, having incredibly serious effects depending on the strength of the impact. 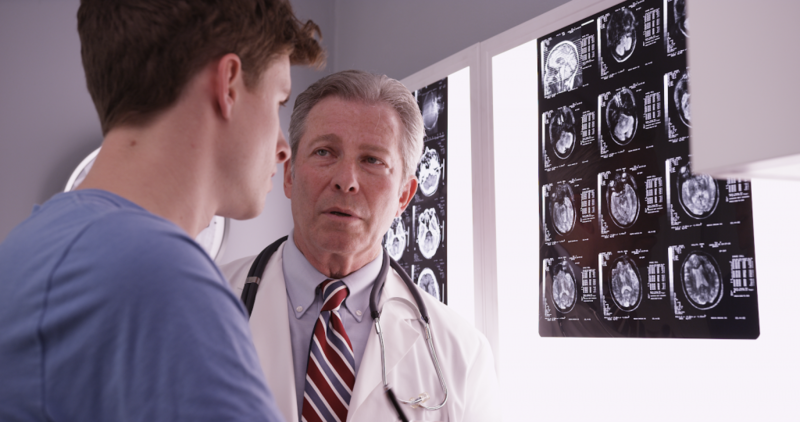 Concussions are deemed mild traumatic brain injuries, however long-term damage can still occur. Memory and concentration problems are possible extended results of an intense concussion. If you have any doubts that your athlete may have a concussion or any trouble with their head, always err on the side of caution and take them to a medical professional for treatment. After impact with the ground or another surface, there are signs that you should be looking for to determine whether or not someone is experiencing brain damage. According to the Mayo Clinic, there are different symptoms for different levels of brain damage. In a situation of mild TBI, you should go in if you are: losing consciousness, vomiting, having difficulty speaking, trouble with your balance, and others. Severe traumatic brain injuries will have scarier symptoms, such as: unconsciousness for long spans of time, seizures or convulsions, slurred speech, unusual behavior, weakness, and comas, amongst additional possible indications. There are truly an innumerable amount of ways that brain damage can occur. Hitting your head against the ground is only one of them, and athletes should always be cautious if an impact is experienced. Should the worst occur and you are faced with a traumatic brain injury diagnosis, know that you and your family are not alone throughout the recovery process. TryMunity was created as an exclusive community for TBI survivors and their loved ones to share their stories and to partake in a community of people going through similar experiences. Join TryMunity today by going to community.trymunity.com/.